By David Tease, Golf NSW. A veritable who’s who of Australian Golf from over the last quarter of a century has descended on Thurgoona Country Club Resort, Albury, in readiness for the inaugural Men’s NSW Senior Open which gets underway Thursday. The field boasts Major winner Ian Baker-Finch and at least four past Australian Open Champions. It also includes former Australian PGA Champions and at least a dozen other multiple winners on the Australasian PGA Tour. “The members are pretty excited about having the tournament here,” 2012 Australian Open Champion Peter Senior said. 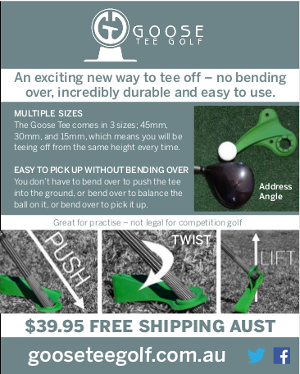 “Golf NSW, the PGA, they’ve done a great job to get this together. All the guys are here to play. You couldn’t get a better field, or a better first up course for the Senior Open,” Senior added. Wednesday’s Pro-Am was the first chance for many of the PGA Legends Tour participants to get a first-hand look at the meticulously turned out Thurgoona layout and Senior was impressed with what he saw. When pressed for a winning score for the week, the pair were non-committal. Parry believes that it would be determined by pin placings, while Senior felt playing from the right places and the quality of the greens would dictate how good the scores will be. ”The greens are that good; they will dictate how good the scores will be. Keep it on fairway if you can, and get to double figures, then I think you’ve got a chance,“ Senior said.